Back in 1974, I had acquired a nice paint gelding from Marvin Phillips. Marvin had only owned the horse for a couple hours before trading it to me. Marvin traded for the horse from Butch Livermont of Interior, South Dakota. I think Chuck Willert from Kadoka had the horse before Butch did, and the horse had been born in Wyoming. This nice paint was four years old when I got him, and Butch Livermont’s brand 4xL was on his left hip. 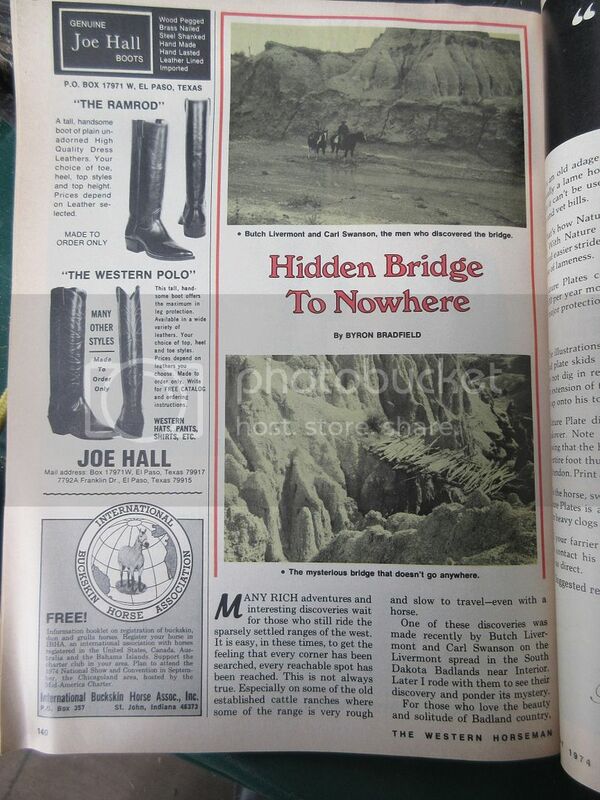 The May issue of THE WESTERN HORSEMAN came out about then, and in it was a story “The Bridge to Nowhere,” by Byron Bradfield. 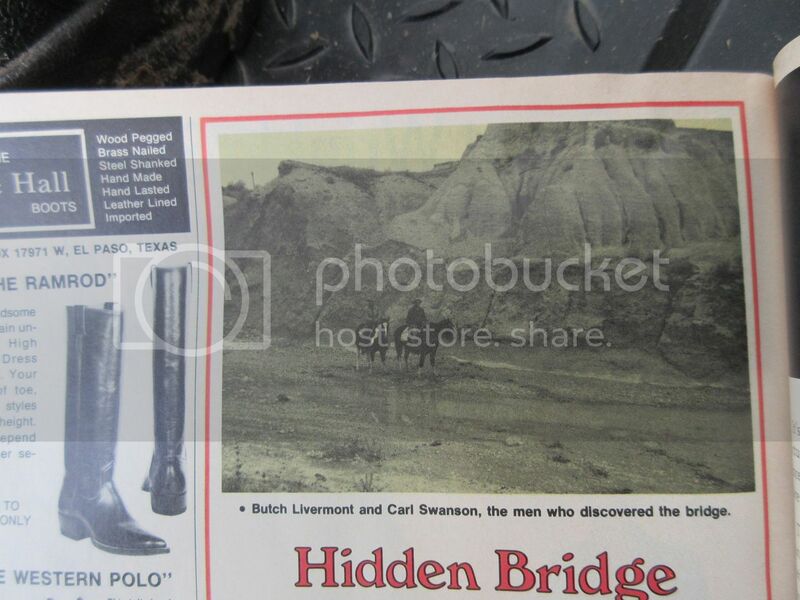 It tells about what was then a recently discovered old wooden bridge in the Badlands. I immediately recognized my new paint horse as the one Butch Livermont was riding in the picture. A few year later, I asked Butch why he traded off this horse. He said he got tired of him bucking all the time. My new paint was a bit bronky, and I’d usually let him buck around the corral for a few circles before getting on. This might not be the most macho cowboy way, but it works quite well, and saves wear and tear on the rider’s backside. I called this horse Rosebud Rebel, and he was one of the best horses I’ve ever owned. He was very catty and quick on his feet, besides being a tough endurance horse. He could really watch a cow, and put one wherever it needed to be. I had ol’ Rebel from the time he was four until he turned 18. At that time, Gary Ruse from Gordon was looking for a potential barrel horse for his daughter Becca. Gary and his father-in-law, Ray Keith, had restored a nice two-seated wooden-wheeled buggy. It was for sale, and I was thinking about making a trade of the horse for the buggy. My father-in-law, Royal McGaughey, admonished, “Don’t trade for a buggy. They deteriorate awful fast.” I responded, “What about 18 year old horses? They do, too.” The buggy was valued at $1000, so I thought that would be a good price to ask for my horse. We traded straight across. My family and I have used this buggy extensively through the years, and have had two other sets of wheels built for it. We still have the buggy, which is in remarkably good shape as it is always stored inside, and it didn’t deteriorate too badly after all. I never hook it to a team to this day that I don’t fondly remember my great Rosebud Rebel horse. On the same year, in the spring of 1974, my dad purchased a good looking paint gelding from Jerry Lessert. Jerry was living west of Merriman on the Ed Belsky place, and was mainly making a living by trading horses. The television show DALLAS was in full swing at the time, so Dad named his horse J.R. Both my dad and I felt very well mounted on our two paint horses. J.R. was equally as good a cow-horse as was my Rebel. They were matched in size and confirmation, but their spotted color patterns were different. Rebel was a tobiano, and J.R. was overo. Dad and I had a lot of friendly competition during those years discussing and demonstrating who had the best horse. I will say that Rebel was smoother riding, and I wouldn’t have traded horse for horse because of that factor alone. Joan Buckles painted a nice picture of these two horses tied to Dad’s yard fence, with the dinner bell above them. The picture was entitled “Coffee Time,” and it is a good one. Paint horses were starting to become quite popular. I thought it would be fun to get in on the action of raising one or two a year. My friend Jerry Lessert knew where there were some young paint mares that were expecting colts in a few months. He went with me one Sunday afternoon, and we journeyed up to the ranch of Stanton Anderson, near Belvidere, South Dakota. One of these young mares especially caught my eye. They were supposedly registered Paints, so I asked to see the pedigree. Stan rooted through a pile of papers, and said, “I think this is the one.” We took the paper out to the horse, but the color drawing pattern on the paper didn’t match with those on the horse. He assured me that they were close enough, and that if there were any other pedigrees in the pile that were closer to the right markings, we could use it instead. There was a twinkle in his eye with this statement, and I was beginning to realize that if I bought the mare, the papers would not match. There was another way to get a spotted horse registered in the Paint Horse Association in those days. It was called the “hardship clause,” and was a legal way to get a horse registered. I think I paid $700 for the mare, with the idea I’d get her registered with this hardship clause. I took her home and did just that. A couple months later, she produced a classy filly baby, even though I’d secretly been hoping for a horse colt. This paint filly was born in the spring of 1979, when I was still with Dad on his Green Valley Hereford Ranch northeast of Merriman. Carol and I got married in June of that year, and moved 18 miles south of Merriman to the old Lester Leach family ranch, which Dad had purchased in 1967. At this time, I took my saddle horses, four new Belgian draft horses, and this paint mare and baby filly along to the new ranch. Across the hills about seven miles to the southwest was the Tailbone Ranch, owned by George Maynard Adam. Maynard was a doctor in Hastings, and his brother Bernie was taking care of the ranch and living there. Bernie was young, single, carefree, and a competitive roper. He had an arena on the ranch, and a friend Mick Von Tour was also there. These two fine young men batched, roped a lot, traveled a lot, and Carol and I enjoyed having them for neighbors. Bernie and his brother, Maynard, were also into raising paint horses. One time Carol and I had Bernie and Mick come up for supper. I showed them my paint mare and filly, and Bernie mentioned that he had a nice young green-broke gelding that he would trade for the mare and filly, if I was interested. At the earliest opportunity, I drove my red pickup through the hills to the Tailbone Ranch, to check out the possible trade. I’d been there about thirty minutes and we were shooting the breeze, when all of a sudden a black dog came running towards us following the trail road. It was my old black Lab, Shadow. She had trailed me all the way through several pastures with no roads. I didn’t realize she had wanted to come, but did give her a ride in the back of the pickup when I went home. I looked at the young gelding that Bernie had for trade. He looked to have potential. He wore the G2 brand that belonged to Glen Hollenbeck from Clearfield, South Dakota, and had been raised by Glen. He was known to produce fine using horses. I don’t recall how Bernie happened to own the horse. We decided to make the trade. A few days later I called to see if Bernie and Mick would be home, if Carol and I brought over the mare and colt. They said they would be there sooner or later, as they needed to work on a windmill. Carol and I saddled a couple good horses. She rode Bowring, a big sorrel gelding, and I was astride Sandbur, a big roan half Tennessee Walking Horse-half Quarter Horse that Hub McMurtrey had raised. The paint mare wasn’t halter broke, so Carol and I drove her and the filly the seven miles between our Spearhead Ranch and the Tailbone Ranch. When we arrived at the Tailbone buildings, Bernie and Mick weren’t yet back from their windmill job. The G2 horse was in a round corral, so I took my saddle off the roan and started messing with G2. I got him saddled and choused him around for several circles. I got on and was getting along pretty well when Bernie and Mick arrived. After exchanging greetings and completing the trade with handshakes, I mounted G2 again for the ride home. Carol on Bowring led my Sandbur horse home, and by the time we’d ridden the seven miles back, the G2 horse was behaving remarkably well. I had him for a month or two, and then traded him to Mark Fish. Mark used him as an arena rope horse, and with him won quite a bit of money. And that is a short story made long of my horse trade with Bernie Adam. I sure enjoy your "Stories"
Liked the Runaway one as well. Hope we get a few more this winter. Could you please post the other page to the story about the bridge? Big Muddy rancher wrote: I sure enjoy your "Stories"
I'm sorry, BMR, but that last sentence made me laugh. I have lots of old Western Horseman magazines I have been wondering what to do with. Maybe I should ship them up to you. Good horse tradin' story, Soap. for everyone to listen to. It's pretty entertaining as well. Regretfully that old WESTERN HORSEMAN is once again buried deep in the pile, back in the storage shed. Besides, it's cold and dark in there. Suffice it to say the bridge went nowhere, and no one ever knew why it was ever built. You'll just have to take my word for it.